Sensitizing the feet. Teaching the horse how to move their feet forward, backwards, left, and right. Getting basic lateral softness on the ground. Riding issues on the second day if your horse is ready. Helping you solve different trail riding issues both on the ground and under saddle. Getting you and your horse performing together as partners. Issues like crossing water, bridges, logs, spooking at things on the trail, etc. can all be solved in this clinic. Come learn to train on the trail! 3.) Colt starting. 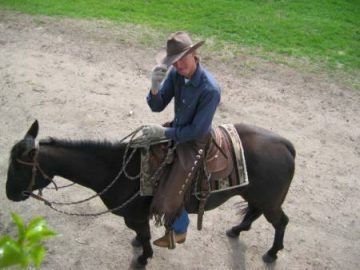 3 day clinic to show you how to start a colt in a safe and successful manner. Please make sure your horse has their teeth done by an Equine dentist before the clinic and that the horse is halter broke . Contact me to put one of these on! 4.) IN DEPTH GROUNDWORK- Strictly a ground work only clinic teaching you how to gain control of your horse feet on the ground by moving them in all directions. A great clinic to start the year off with horses being more fresh or if your planning on coming to a colt starting clinic. A respectful, non reactive horse becomes a safe willing partner. Start time of around 9am with a lunch break and then whenever it ends with the last horse. I am flexible on the end time as I want every horse/owner to end on a good experience. Also I suggest your horse gets their teeth done by an Equine dentist (See equine dentist page)). Your horse will offer a lot less resistance when the dentistry is done. Clinics held at my place will be for smaller groups (4 people) and are weather dependent as it is an outdoor facility. Contact me for more information with questions you may have. Prices are $300 for the 2 day clinics and $400 for the 3 day clinics (One or two of these a year). $100 deposit to book for a future clinic. Auditing the clinics as non participants is $50 for the 2 day clinics and $75 for the 3 day clinics. Clinics for 4-5 people maximum. Like to keep smaller groups so everyone gets individual one on one time. Here is my schedule for my first three clinics for 2019. Weather dependent on the first few clinics of the year. Looking forward to teaching again for 2019 and helping you achieve some goals with your horses. April 19- 21st- Colt starting Clinic with guest trainer Brent Trout and myself. Open to 6 people and a cost of $425 for the three days. Open to horses 2-4 yrs old and no wild unhandled horses. Please contact for more detailed informational / requirements for horses coming to this clinic! Taking deposits to hold spots! Please contact for more information. Thanks! 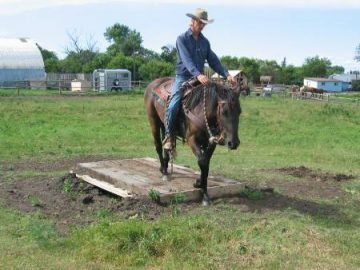 Also check out Winding Road Horse Training on FB or Stephen Braun on Facebook, Winding Road Horse Training Clinics With Stephen Braun on Facebook.